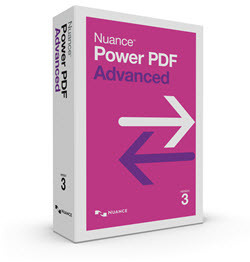 Nuance Power PDF Advanced is the leading PDF solution that makes it easy for demanding users to gain control over PDF workflows in every department and for every use. with the ability to create, convert, assemble and sign industry-standard PDF files with superior accuracy, you’ll be freed from the compromises of traditional PDF applications. Nuance's Document Imaging Division is now part of Kofax. Learn more. Best customer experience and value: Power PDF is the smarter value in PDF software, leading the way in secure document workflows with intuitive tools that act like a familiar Microsoft Office® 2016 ribbon experience that also supports touch-enabled Windows® 10 tablets and laptops. It features an impressive array of functionality specifically designed to make business staff and mobile professionals more productive at an incredible value. Secure document workflow with integrated DocuSign® functions: Sign, send and validate documents with DocuSign® and Power PDF Advanced. One-click access to sign, initial and date stamp a document before sending to recipients you define. Send a document for signatures in one click, specifying where recipients should initial, sign, date and more. With a pre-installed DocuSign® root certificate, users can quickly validate PDFs signed with DocuSign® through the Security menu in Power PDF Advanced. Turn papers into PDFs more accurately: Create PDF files directly from your scanner with time-saving, one-click scanning to PDF. Scan to standard image, searchable or editable PDF formats. Scan and highlight, cross out or underline – all in a single step. Create PDF files from any PC application that can print: Instantly create 100% industry-standard PDF files with security options that are fully compliant and compatible with all PDF viewers. You can even add bookmarks and transfer hyperlinks when creating PDF documents from Microsoft Word, Excel or PowerPoint. Archive important emails as PDFs: The textual, written content of an email can often be as important to your work as its attachments, if not more. So archiving them can be critical to your business. With Power PDF you can easily archive Microsoft Outlook emails and complete email folders as PDF files together with their attachments. Store the converted emails on your PC or document repositories and retrieve them when needed. Publish accessible PDF files: People with disabilities require accommodations to allow easier access to information and navigation of software applications. In some industries and in government work, accessibility is a regulated requirement. Power PDF makes it easy to create PDF files that are accessible to the tools and systems that people with disabilities depend on. Don’t retype your documents: If you must work with PDF documents in other applications, don’t waste valuable time recreating them – convert them. Complex layouts with columns, tables and graphics are accurately and faithfully reproduced in Microsoft® Word, Excel®, PowerPoint® and Corel® WordPerfect® documents. You also get exceptional spreadsheet control and features to allow you to combine all pages of a PDF document into a single Excel worksheet to eliminate tedious cutting and pasting. You can even select, copy and convert just the selected areas of text you need from a PDF document. Combine and assemble documents with ease: Combine files and remove or replace pages with drag and drop ease. View and select pages from a source document – such as Word, Excel, PowerPoint, WordPerfect, JPG, BMP, TIF or XPS – to insert into a target document. Just drag and drop the pages to add them into the PDF file, then swap or duplicate a page, or range of pages, when needed. Combine all open documents with one-click, and the original file names will become bookmarks in the new PDF. Use batch tools to automate repetitive tasks and improve efficiency throughout the workplace. Produce more professional-looking documents: Deliver documents that look as good in print as they do on screen – no matter where you send or view them. Combine any type of file and/or folder into modern PDF Portfolios that can be viewed with any popular PDF reader. You can even add pictures, graphics, movies, audio or 3D drawings to PDF documents to communicate your message with attention-grabbing style. Connect your documents to the Cloud: Now you can save and access your stored documents in the cloud by connecting directly to Box, Evernote, Google Drive or Microsoft OneDrive. This gives you access to your documents anytime, anywhere through the Web or by the applications of supported mobile devices. Speak your notes: Use integrated Dragon Notes to easily speak and see your text created as notes within your PDF without typing – it’s fast, accurate, saves time and increases productivity. Collect information with forms: Don’t let the hassle of filling out long forms slow down your business. FormTyper™ automatically converts non-fillable forms into fillable PDF forms that you can complete, save and email. Create forms from scratch using easy-to-use form drawing tools. Export information in filled-in forms via email or web server so you can sort, search and analyze the data using popular database and spreadsheet file types such as XFDF, HTML, XML, TXT and CSV. Ensure PDF/A compliance: Take advantage of a simplified way to meet PDF/A compliance requirements and ensure that PDF files can be accessed by any PDF reader, now and in the future. Users are notified if a PDF/A file does not meet compliance requirements so they can fix them on the fly, further saving time and making sure the files are in full compliance. The PDF/A Compliance Checker can analyze PDF files for PDF/A-1a, -1b, -2a, -2b, -2u, -3a, -3b and -3u compliance. Save/open documents interacting directly with document management systems: Users can save PDFs to the most popular document management systems (DMS) on premise at your location or located in the cloud. It’s now easier than ever by accessing them directly from the Open/Save menu or from Internet Explorer. Simplifying this process saves users time while providing them with faster, easier access to the DMS solutions they are already working with. Perform smarter searches: Get the most accurate conversion to searchable PDF available with any PDF solution. Search everything in a document – even the contents of bookmarks and comments – so you’re sure to find what you’re looking for. Benefit from advanced search functions that list and highlight all instances of found words on the document, so you can locate them easily. Use the intelligent Looks Like Search™ capability to quickly find content like phone numbers, email addresses and Social Security numbers via an alphanumeric pattern rather than exact text. Automatically highlight, cross out or underline search results for faster, easier PDF editing. Enhance document security: Utilize Microsoft Active Directory Rights Management Services to lock down confidential documents without passwords and apply customized protection for each recipient. Open and work with PDF documents, which were protected with FileOpen DRM, based on granted rights. Add passwords with secure 128-bit or 256-bit AES encryption and permission controls to PDF files to control document viewing, printing and modification. Use the advanced redaction capabilities to automatically inspect documents and remove sensitive data for safe, secure document sharing. Authenticate document owners using self-signing, Microsoft Crypto or third-party digital signatures. Flatten everything in a document – including signatures, stamps, markups, annotations, filled form fields and graphics – for enhanced document security. This feature is especially useful for limiting document modification during archiving or e-filing. What's New & Why Upgrade? The new PDF 2.0 standard focuses on the file format, assuring both compatibility and security with programs utilizing and manipulating the file. Be assured that you’re creating the most compatible and secure PDF documents possible with the new Power PDF. Whether you’re approving a purchase, closing a sale, or signing an agreement, it’s easy with DocuSign®—reliable and trusted worldwide for electronic signatures. Users of Power PDF Advanced can now choose to sign a PDF they’ve been working on, or send it to another party for signatures through the integrated DocuSign® actions in the Security menu. Documents can be created and edited, together in Power PDF and in real-time, without having to send them back-and-forth amongst various parties, leading to more efficient work. Now featuring the ability to change the interface to the color that suits you best. Choose from blue, light gray, dark gray or the familiar purple. You may also now choose to view documents in separate tabs inside one Power PDF window, or to view each document in a separate Power PDF window. Users of Power PDF now have a more efficient way to combine all of open documents into a single PDF – just click the “Combine All” option on the Home toolbar and bookmarks will be created from the file names of the original documents. Integrated improvements from the latest version of Nuance OmniPage technology, leading to even better word, number and layout accuracy. Improved the capability in Power PDF to separate blocks of text in editing mode, thus making editing and reflow easier. Turn web pages, or entire sections of web sites, into richly interactive PDF files with automatically embedded hyperlinks directly from Power PDF. Save time with quick access to settings relevant to what you’re currently working on when an appropriate item has been selected. Users will enjoy the ability to easily swap or duplicate a page, or a range of pages, within the document, from the Document Assembly view. Editing pencil drawing annotations is now much easier and more efficient for users of Power PDF, now that multiple pencil/stylus drawings in close proximity are now grouped into a single annotation. Gives users the option to insert this popular, high quality, compressed video format directly into PDF files created in Power PDF, in addition to being able to attach as part of a PDF Portfolio. Allow text and comments in right-to-left languages (Arabic, Hebrew, etc.) to be properly edited within Power PDF. Web access needed for product registration, activation, product help, Dragon Notes and obtaining live updates for the program. Microsoft .NET Framework 4.0. If it is not detected, it is installed with the product.